It is a familiar scene in many thrillers: a hero or heroine working frantically to defuse a ticking time bomb. There is an accounting “time bomb” of sorts currently counting down, creating anxiety in many organizations that they may not be doing enough to prepare for the major change that is on its way. That change is the Financial Accounting Standard Board (FASB) and International Accounting Standards Board’s (IASB) converged new standard on the recognition of revenue from contracts with customers: Accounting Standard Update (ASU) No. 2014-09, Revenue from Contracts with Customers. The good news is that the date the standard goes into effect has been deferred, giving organizations an opportunity to take a pragmatic approach to implementing systems, gathering data, and resolving issues to ensure a smooth implementation. What is ASU No. 2014-09? 2. Enters into contracts for the transfer of nonfinancial assets, unless those contracts are within the scope of other standards. The new standard eliminates the transaction- and industry-specific revenue recognition guidance under current generally accepted accounting principles (GAAP). When does ASU No. 2014-09 go into effect? While the implementation of this standard has been delayed in the past and the number of questions that have yet to be answered by either the FASB or the IASB remains large, organizations should work under the assumption that the dates below will not be deferred. Public organizations - The standard is scheduled to become effective for all annual reporting periods beginning after December 15, 2017. Nonpublic organizations – The standard should be applied to annual reporting periods beginning after December 15, 2018. Full Retrospective Method: Assuming a calendar year, U.S. GAAP public company would be required to adopt on January 1, 2018. The new standard would be applied retrospectively to each prior reporting period presented with the cumulative effect of the change recorded in retained earnings as of January 1, 2016. Modified Retrospective Method: The new standard is applied to all existing contracts as of the effective date and to all future contracts; the cumulative effect of initially applying the new standard is recognized in opening retained earnings as of the effective date. Under this transition method, companies only need to consider the effects of applying the new standard to contracts that are not completed as of the effective date. Unfortunately, time and time again the conversations have been the same: why do now what we can put off until tomorrow? While these dates are more than a year away, organizations should not put off the work needed to prepare for the changes involved in this new standard, since they will likely face challenges unlike those encountered during other accounting projects. For both public and private companies, CohnReznick recommends starting transition activities now. Below is a recommended timeline for implementation of the new standard. It should be noted that there will be resources required to complete these steps, but with the initial deadline being more than a year out, time is a great ally and it would behoove organizations to take advantage of it to assure a smooth implementation. If management has not already assembled the team that will sponsor and take ownership of the transition process, doing so now should be sufficient to allow for the organization to proceed without too much difficulty. Postponing this any longer could be detrimental to an effective implementation plan. 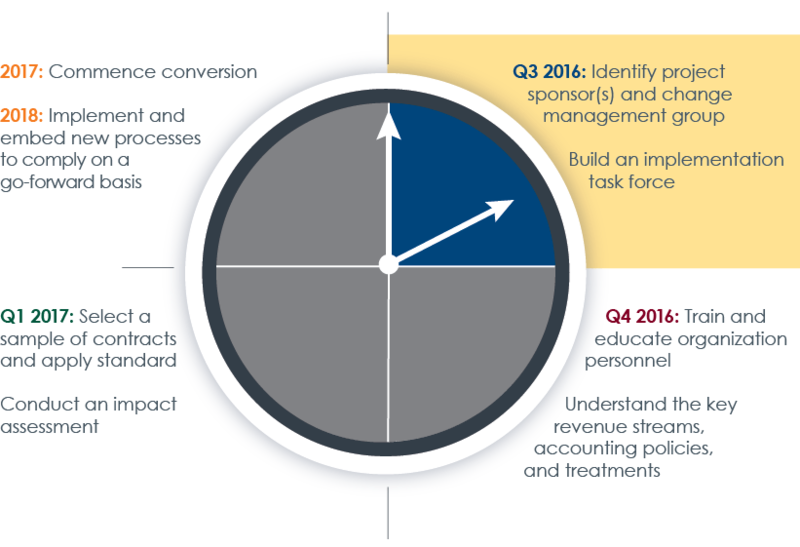 Sponsorship of the implementation process should include the CFO and CIO. This group will be primarily responsible for approving the overall funding requirements of the project, managing the timetable, and monitoring the project’s status. They will also be responsible for the overall transition strategy, and may be the individuals responsible for communicating with the audit committee in the case of public companies. It is extremely important for the Implementation Task Force to include members from various functions within the organization, including accounting and finance and information technology (IT). It is also very important to have members of the sales and operations team involved early in the process as they are critical in identifying the most important aspects of any contracts with the entity’s customers. Furthermore, the salespeople will be able to provide the task force with much-needed information about the company’s processes for negotiating with its customers. In particular, the sales / operations team members will quickly identify whether the organization has a few standard contracts or whether there are many individual contracts that are based upon specific negotiations with each customer. Of course, the accounting and finance team will need to understand how each type of contract will be treated under the new standard and identify issues that might lead to possible changes in processes, internal controls, information systems, or even future contracts. Clearly organizations need to adequately plan for the potential changes to processes, systems, data and controls across the business. Unfortunately, the only way to know how long it will take to implement the new standard is to start the transition process as soon as possible.